Place emphasis on the development of the qualities of COURAGE, HONOR, LEADERSHIP, PATRIOTISM, SCHOLARSHIP, AND SERVICE. Give recognition through the award of American Legion School Award Medals to the boy and girl who are deemed most worthy of the high qualities of citizenship and of true Americanism. The Award Medal represents the educational symbolism of the School Award Medal Program and associates it with The American Legion and its purposes. The medal is applicable for award to either boys or girls in the graduating class of elementary, junior and senior high schools, and colleges. 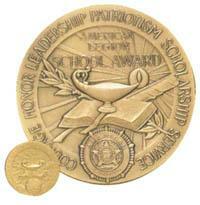 Please click on the link at right to view and/or a leaflet on The American Legion School Award Medal Program. The link at left is a "suggested school award presentation speech".